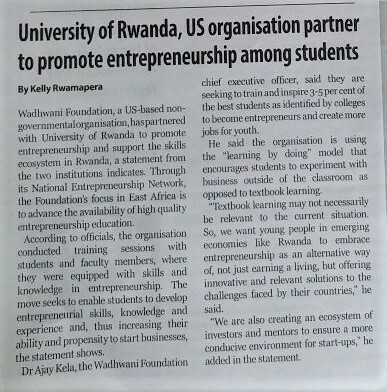 Wadhwani Foundation, a US-based non-governmental organisation, has partnered with University of Rwanda to promote entrepreneurship and support the skills ecosystem in Rwanda, a statement from the two institutions indicates. 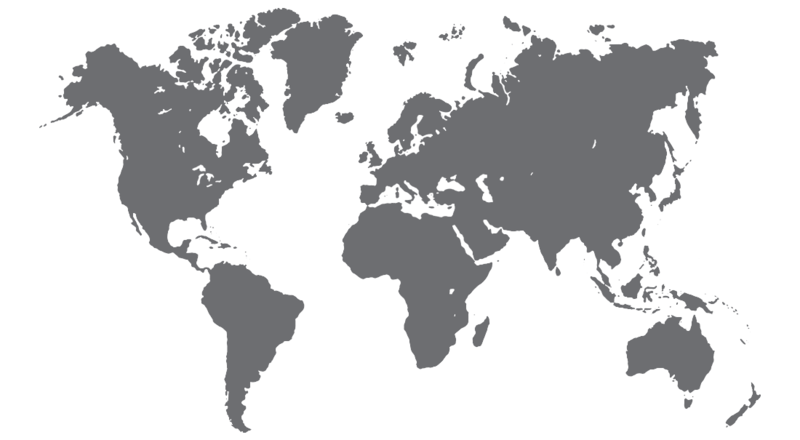 Through its National Entrepreneurship Network, the Foundation s focus in East Africa is to advance the availability of high quality entrepreneurship education. According to officials, the organisation conducted training sessions with students and faculty members, where they were equipped with skills and knowledge in entrepreneurship. The move seeks to enable students to develop entrepreneurial skills, knowledge and experience and, thus increasing their ability and propensity to start businesses, the statement shows. Dr Ajay Kela, the Wadhwani Foundation chief executive officer, said they are seeking to train and inspire 3-5 per cent of the best students as identified by colleges to become entrepreneurs and create more jobs for youth. He said the organisation is using the “learning by doing” model that encourages students to experiment with business outside of the classroom as opposed to textbook learning. “Textbook learning may not necessarily be relevant to the current situation. 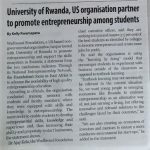 So, we want young people in emerging economies like Rwanda to embrace entrepreneurship as an alternative way of, not just earning a living, but offering innovative and relevant solutions to the challenges faced by their countries,” he said. “We are also creating an ecosystem of investors and mentors to ensure a more conducive environment for start-ups,” he added in the statement.